Removed from a fully working server. Various Manufacturers: 9 x Hynix 10 x Samsung 1 x Micron Please see other items for dual rank versions. DDR3 Samsung 12 GB (6 x 2GB) PC3-10600E - 1333 MHz. Perfect working condition. These have been taken out from working servers for the purpose of upgrades. Removed from a fully working server. Various Manufacturers: 5 x hynix 3 x Samsung 3 x Micron 2 x Nanya Please see other items for single rank versions. 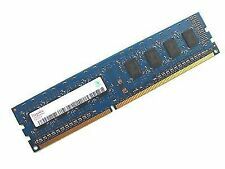 DDR2 Desktop RAM All sizes New Condition. We always showactual pictures which is for atypical item so you have a clear idea of what you're getting and avoid any surprises. Extensivetest procedures. 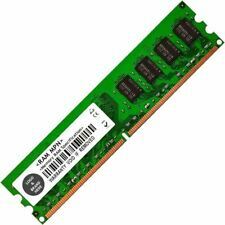 DDR2 Laptop RAM All sizes New Condition. We always showactual pictures which is for atypical item so you have a clear idea of what you're getting and avoid any surprises. Extensivetest procedures. We operate in 10000 sqft warehouse. RAM 2x2GB HP 500209-061 PC3-10600E DDR3 1333MHz ECC suitable for HP G7 N36L N40L N54L MicroServer. Condition is Used. Hynix 8GB (4 x 2GB) PC3L-10600R 1Rx8 ECC RAM. Condition is New other (see details). Dispatched with Royal Mail 1st Class (1 to 2 working days). This sale is for all the x4 modules pictured. Component Composition(256M x 8) x 9. Rank x Org.1R x 8. 6 x 2GB Micron 1Rx8 RAM - PC3-10600E-9-11-D0. Shape Systems Ltd was established way back in 1993 using our experience in the mini systems market. Originally we globally supplied HP 9000, 3000 & 1000 systems & Wang to the corporate market, maintenance & dealers. The Gallery Image is for illustration purpose. Mixed joblot of server (ECC) RAM DIMMs. SAMSUNG M391T5663QZ3-CF7 PC2-6400E 2GB 4. KINGSTON KVR667D2D8F5/2G PC2-5300F 2GB 6 WITH HEATSINK. NANYA NT2GT72U8PB0JY-3C PC2-5300E 2GB 1. KINGSTON KVR667D2E5/2G PC2-5300E 2GB 1. Data Transfer Rate 1333Mhz. Capacity 2GB. Manufacturer Samsung. Bus Type PC-10600. Dell 16Gb (8 x 2Gb) RAM Poweredge 1950 2950 2900 6950 M600. THIS ITEM IS 100% TESTED AND PULLED FROM A WORKING DELL SERVER! Don't mistake this ram for any of the lesser quality modules you can buy! Micron 2GB 1RX4 PC3-10600 Server Memory. Condition is Used. Please note that this is server memory, please check compatibility first. 8 x 2 GB original Samsung 1Rx4 PC3-10600R-09-10-C1-P1. 1Rx4 PC3-10600R. 1333 MHz 240 pin CL9. HP Micron Server RAM 8GB 240p PC2-5300 DDR2-667. Condition is Used. ALL MONIES ARE IN £GBP. Condition: Used, Tested working. These were professionally pulled from working DELL,HP, IBM, and Blade Servers. HP ProLiant ML570 G4 High Performance. HP ProLiant BL20p G3. HP ProLiant DL360 G4p. Storage Capacity 4GB (2 x 2GB ). Technology DDR2. Data Integrity Check ECC. Shape Systems Ltd was established way back in 1993 using our experience in the mini systems market. Originally we globally supplied HP 9000, 3000 & 1000 systems & Wang to the corporate market, maintenance & dealers. 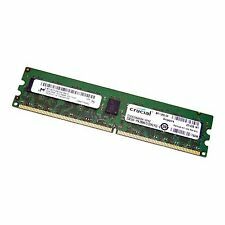 2 x 2GB SAMSUNG 4G KIT M312L5720CZP-CCCQ0 373030-051 SERVER RAM CO-379300-B21. COLLECTION IN PERSON. Audio Visual. Ending Soon. New Arrivals. QUICK LINKS. we do not take any responsibilty after this. you can buy in set of 6 max. Why Choose Us! SK Hynix DDR3L ECC PC3-12800R 2GB Server RAM 11-11-A1 Free postage by Royal Mail 2nd class Recorded delivery. Useful information. Price information. Note, picture is of actual item. What you see is what you get . Credit or Debit Cards. MT18JSF25672AZ- 1G4F1. Technology DDR3 SDRAM Density 2GB Part Status Production RoHS Green. Count 18 Depth 256Mb Width x72 Pin Count 240-pin.